Cross Road Collectables – Selling Vintage Decor, Old China, Pottery, Crystal and glassware. 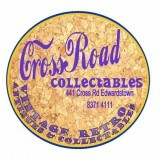 Biggest range of Antique and Collectable bottles,small furniture, Rustic goodness. Old Suitcases, wooden boxes, tins, comics vintage magazines,VINYL RECORDS, Stamps, Sheetmusic, TOOLS, 2ND Secondhand items. Retro, Kitsch, Practical, Useful. Also signed Sports Memorabilia.